Maybe you’ve felt inspired by watching stars learn to dance. Or maybe you have a special event coming up. 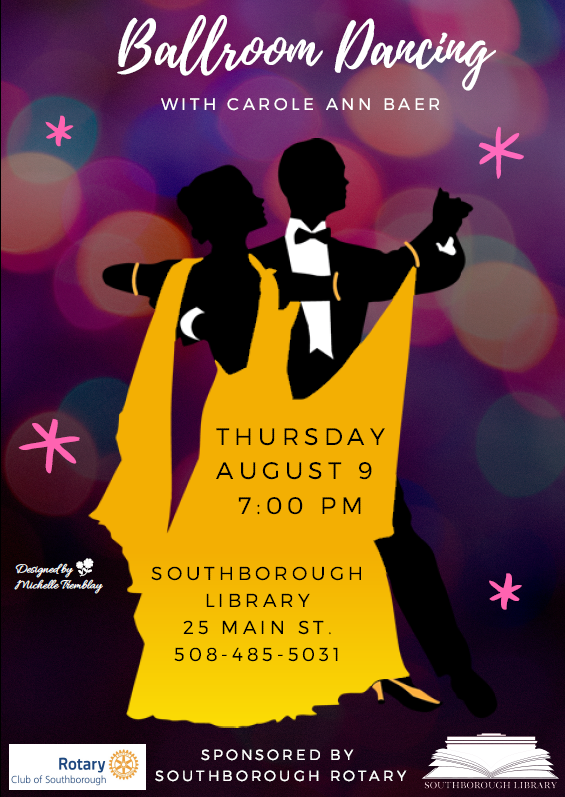 If you have an itch to learn some ballroom dancing steps – the Southborough Library’s looking to scratch it. On Thursday night, August 9, the Library will host an introduction to Ballroom Dancing. The free lesson will focus on a waltz style dance. This introductory session will be taught by dance instructor Carole Ann Baer. Carole has been teaching ballroom and latin dance for over 30 years. She has taught at Keefe Tech Adult Ed, Needham Adult-Ed and also Lincoln-Sudbury Adult Ed. Carole also teaches dance at Brandeis University and has taught at several dance studios over the years. The intro will take place at 7:00 pm in the library’s Main Floor programming space. No registration is required.